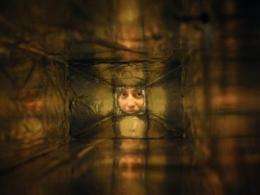 (PhysOrg.com) -- In a basement laboratory at MIT, assistant professor of physics Jocelyn Monroe is making some final adjustments to her team's newest particle detector. In just a few months, the detector will be 1,600 feet underground in Carlsbad, N.M., searching for the elusive particles known as dark matter. What if dark matter particles aren't WIMPs? 4) Why we've decided that there is a stationary "dark matter wind"
In science no "solid evidence" exist for anything. But there are many "less-solid" evidences, which leads to the same conclusion in many cases. We can add gravitational anomalies like Alais effect, Pioneer anomaly and some others. Situation is complicated by fact, most of dark matter is formed by composite effects (deformation of space-time due the omni-directional space-time expansion and less or more massive particles trapped inside this deformation). Currently we're distinguishing so called cold dark matter formed by space/time deform and or very lightweight particles (neutrinos, axions) and hot dark matter, formed by heavier, yet weakly interacting particles (WIMPs, heavily ionized atom nuclei, particles of antimatter, etc...). This complicates formal models, because particle models of dark matter often doesn't play well with the another ones. Interesting reading above. However, none of the reading prevents me from returning to my fundamental issue with Dark Matter: that the strongest evidence FOR it involves gravitational anomalies. It is much easier for me to convince myself that we don't have a true understanding of how gravity operates on a macroscopic level. So anyone got a good book for me? So if there is no dark mater, how do you explain gravity where there is no mass? There are places in the Cosmos where light from distant objects is bent, but there is no visible mass there. That is dark matter, whatever it is. The simplest explanation is it is some type of WIMP. That's not the only explanation, it's just the simplest. In my own humble opinion, revising the laws of gravity and Theory of General Relativity to explain the anomalies is a much more complex solution. Invoking some new unproven theory is even more complex still. Generally science solves these problems by looking for the simplest solution first. While there is absolutely no proof that the WIMP solution is the correct one, if it's not, then we are all off down a rabbit hole where no one has been before. While that may sound like a great adventure, it's not the way science works. So if there is no dark mater, how do you explain gravity where there is no mass? There are places in the Cosmos where light from distant objects is bent, but there is no visible mass there. That is dark matter, whatever it is. In my own humble opinion, revising the laws of gravity and Theory of General Relativity to explain the anomalies is a much more complex solution. Your assuming that the object your observing is lensed. There is no proof for that. Especially if you stick strictly to Einsteins predictions about lensing shape. You dont have to revise relativity but only to bring back some form of aether. If you think about it dark matter and energy already are some form of basic energy. Excuse the pun and potential ignorance. Wild stab in the dark here, but couldn't gravitational waves form interference patterns? If so, wouldn't the peaks act as gravitational anomalies? Something along the lines of anti-Lagrange points, on a galactic scale. Has this been considered as an alternative to dark matter? @kasen, interesting idea, the total gravitational energy of the system would remain the same, so the peaks would be compensated by troughs, right, ...or am I misunderstanding your point? Well, the troughs would either act as negative gravity points, or just as null gravity points. I suppose the latter would violate some conservation law, so it's negative gravity. Which, as a quick wiki search shows, is commonly known as dark energy. Nothing on gravitational waves, though. When trying to visualise, I imagine hills in spacetime(or divergent density gradients, hehe). The problem is, as far as light is concerned, the effect would be the same as positive gravity, so I'm not sure how you could test this idea. Maybe with a stream of massive particles, small enough not to interfere too strongly? Shot between two bigger sources of gravity, it should change direction alternately at different points, corresponding to peaks and troughs. Might be observable only at really large scales, though. Earth-Moon could do. I still believe that an article I saw on here recently is on the path to the right answer. That paper suggested that there is in fact a 5th force of nature that we haven't realized yet, and we are trying to make all of the theories fit with observations by making up things as we go along because everyone assumes that the 4 fundamental forces encapsulates everything. Maybe the 5th force is the missing link in all the equations. As those researchers pointed out, they didn't set out to discover or prove the existence of a 5th force, it just appeared in the math they were doing to reconcile dark matter with standard physics.